You may have noticed ice dams on many of the houses, perhaps even yours. Ever wonder if they, and the icicles that go with them can cause real damage to your house? 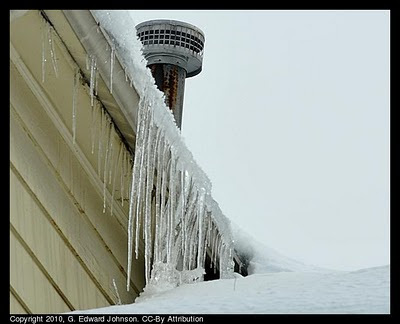 What Causes Ice Dams: Ice dams form when snow on your roof melts, then the water runs down into the gutter an re-freezes. There are generally two ways the snow melts, either the sun shining on the roof melts it or heat escaping from your house into the attic melts the snow from underneath. The latter is usually the cause, most of the houses here in Bethesda are old and poorly insulated. What type of damage can occur: There are two primary types of damage ice dams cause. The gutter can pull away from the roof and fall. In the top picture you can see that the the bottom of the gutter isn't flat, it is leaning down. This is because the gutter, and the board it is attached to is pulling away from the side of the house. I could actually look into the attic from the outside. The ice dams in the gutter can cause melting water to back up behind them and go under the shingles and make it into your attic. The water then can drip down through the ceiling into the rest of the house. I had this occur after the last snow, a steady drip of water coming in near one of my windows. Short term fixes: If you actually have water leaking into your house, the first thing you want to do is stop it. I have run across three actions you can take to stop it quickly and you may want to do all three. Put a fan in the attic blowing towards the leak. This is probably going to be your quickest and easiest solution. Generally it isn't the whole attic that is too warm, just a few spots where the insulation is thin or air is leaking up through the walls. The fan blows cold air under the leaking water that re-freezes, causing the leak to stop. This is a very short-term solution, as soon as you turn the fan off, the ice will start melting. Shovel off the roof. If there isn't any snow to melt, there won't be any water to get in the house. You likely will just have to shovel off the area above the hot spot. This can be dangerous, see below for more tips. Fill a stocking full of rock salt and put it over the gutter. Take a look at the picture below, you can see that I put the stocking vertically down the roof and over the ice dam in the gutter. The salt keeps melts the ice forming a channel through the ice dam that water can go through. It took about 2 days to melt the channel you see in the picture. You can use any solid snow-melting compound, it doesn't have to be salt. Insulate your attic better. If the problem is caused by heat escaping from the house through the roof, insulating the attic can fix the problem and save you a bit on your heating bill. Put an impervious barrier under the shingles. This of course means removing all the existing shingles and putting new ones on. This can be a large added expense but if you were planning on replacing your roof, it may make sense. This doesn't actually prevent ice dams, it just prevents water from leaking into the house, you could still have problems with the gutters pulling away from the house. Rent. This doesn't really prevent the problem, it just makes it someone else's problem. Shoveling the roof: The recommendation that I hear is to let a professional do it, and for good reason, it can be very slippery on the roof, you could easily fall and hurt yourself. You can also damage the roof with your shovel. If you choose to try it yourself, here are a couple of things I noticed: Stand in the snow. Usually you stand in the area you have already shoveled but on your roof that isn't a good idea, the snow provides more support than the cleared roof. Shovel from the top down, particularly if you are clearing the whole roof. I found it was easier to stay standing in the snow, and I didn't have to worry if I didn't through the snow far enough and it landed lower on the roof, I'd get to it later. Shovel from the outside in. You can push the snow off the edge of the roof. I had good luck starting at the top of the roof at the edge and working my way down, then going back up to the top and clearing another row down. Once I was far enough in that I couldn't get the snow off the edge, I'd toss it to the bottom. Don't do it alone. If you do fall, you want someone to notice and get help, you could be hurt badly. Call a professional. Even if you are being careful, it is still a risky activity. Pros have a lot more experience. I started to slip several times while on the roof. 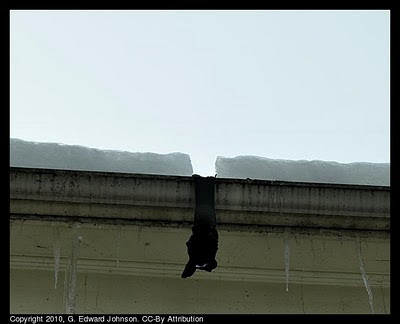 Great Blog with some good points on how to prevent ice dams. Another option to consider is the easy retrofit of a Thermal Technologies roof deicing system for a home’s roof eaves and valley's. It will permanently solve any ice dam issues cause by heat loss from the home, radiant heat from the sun, difficult exposure, poor architectural designs…. the list goes on. There can be many challenges to trying to fix a poorly designed home and attic structure. Check them out at www.thermaltechusa.com. Excellewnt article! But what about the wet insulation trapped inside the wall from the ice dam? Just so everyone knows, all insurance companies cover just visible signs of damage, so eventually this could lead to black mold. If a leak was very bad, I would highly recommend to open a small part of the wall for the insurance adjust to see because no insurance company will cover the removal of black mold.